We expect everyone in our HR teams to be curious and to demonstrate commercial awareness, collaboration, flexibility and healthy challenge. We even have our own HR development programme, Flourish, which is designed to help you develop these behaviours. Our Shared Service team is a great place to build an HR career, with opportunities for you to specialise in employee relations, payroll, reward or talent management. Show a real talent for working with business leaders and there is also a chance you could progress into a HR Business Partner role. Explore our HR teams to see where you fit in. Supports managers across the business with a wide range of people challenges. Partners with the business to deliver corporate PR and colleague communications, as well as driving internal and external engagement. 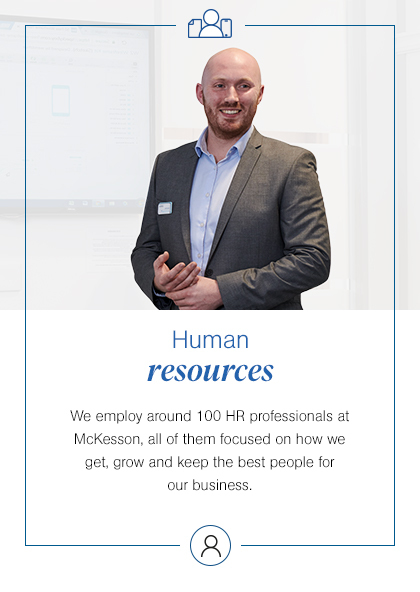 Provides McKesson colleagues with a dedicated range of first-line support and administration services in areas including learning and development and resourcing. Focuses on resourcing, learning and development, and talent management, and plays a key role in supporting our “Get, Grow, Keep” HR strategy. Ensures our colleagues receive a competitive reward and benefits package, and works on developing and implementing our total rewards strategy. Responsible for delivering our payroll in an accurate and timely manner, and for providing first-line support for all our colleagues. Our HR Business Partners bring people expertise to business leaders, enabling them to develop high-performing teams and empowering them to deliver amazing customer care.